Julian Bond, a writer, professor, politician, social activist, and leader in the American Civil Rights Movement, died on August 15, at age 75. 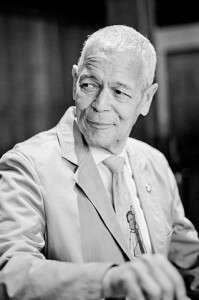 Julian Bond in 2012. Photo by Eduardo Montes-Bradley [CC BY-SA 4.0]. Originally recorded on a reel-to-reel audio tape, PSU Library Special Collections and University Archives staff recently transferred the audio to digital format. Professor Bond’s lecture at PSU is one of many in the Portland State University Library Oregon Public Speakers Collection. Between 1958 and 1979, Portland State University hosted over two hundred speeches, interviews, panel discussions, and readings by scholars, activists, politicians, authors, artists, and community members. The recordings in this collection reveal an era of vital dialogue and debate supported by the university and its community. The original recordings of these events were captured on reel-to-reel tapes by Portland State audio-visual technicians. For a time, the tapes were available as a library resource, but after reel-to-reel technology was superseded the collection fell out of use and was not included when the library catalog went online. The tapes spent years in storage until their rediscovery by PSU’s University Archivist. With the generous support of the Institute of Museum and Library Services through the Library Services and Technology Act, new digital transfers of the original reel-to-reel audio recordings are now available to the public in the Oregon Public Speakers Collection.